ALBUQUERQUE, N.M. – The Albuquerque Police Department has reached primary compliance with 93% of the Court Approved Settlement Agreement Requirements. Independent Monitor Dr. James Ginger released his fifth progress report Tuesday, May 2, 2017. The report shows not only has the department increased primary compliance but also shows significant increases in secondary compliance. 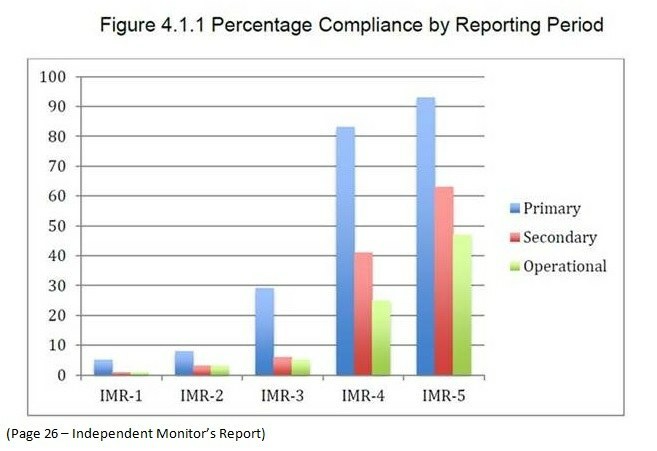 The Department’s operational compliance has increase by 88% since the last reporting period. The Independent Monitor praises the department for its policies, training and use of Electronic Control Weapons (more commonly known as Tasers) stating, “This stands as perhaps the brightest spot in APD’s compliance Efforts with policy, training, and supervision all showing marked and substantial improvements”. Dr. Ginger also states the Department reached a “major milestone” by increasing supervision in the field and decreasing the ratio of sergeants to officers. He commends APD for its commitment to the Behavioral Sciences Unit and also notes there has been further improvement in policy development and training in relation to mental health interactions and systems. Officer involved shootings have decreased 53% from 2010. Overall officer firearm discharges have decreased 72% from 2010. Of the 112 SWAT activations in 2015, 2016 and so far in 2017, only 9% of them resulted in force being utilized and no fatalities. "APD has made progress in all areas of the Settlement Agreement. As the Monitor has stated, 'This is a marathon, not a sprint'. Our goal has been and will continue to be sustained, long-term compliance and reform in all areas of the CASA," Chief Gorden E. Eden Jr., Albuquerque Police Department. To address concerns in the latest Monitor Report, APD has already implemented Use of Force Training Updates, Supervisory Use of Force Updates and will be conducting additional training for further improvements.